If you’re a close up or macro photographer, the Death Valley Super Bloom for 2016 is amazing. For panoramic photography, it’s a bit underwhelming as this sweet but subtle phenomenon is swallowed up by a wide lens. 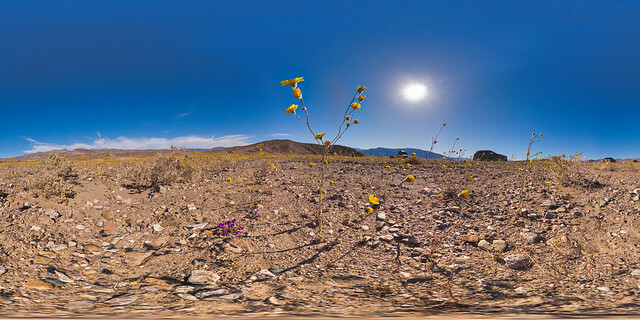 In this shot, a lovely “carpet” of Desert Gold (Geraea canescens) can’t quite fill the frame in 360. But look to the horizon and you’ll see a the floral equivalent of a Milky Way of yellow flowers. Also, while I never observed a “blanket” of Notch Leaf Phacelias, I did see dozens of sphinx moth caterpillars munching on the flower’s leaves which are easier to observe close up. I went out to experience the super bloom yesterday and apparently the phenomenon is in full effect and expected to be for another week or so, according to the ranger I spoke to at Stovepipe Wells Visitor’s Information Center who also advised me on the best places to see the wildflowers. For me, I recommend taking a nice little loop drive up the Beatty Cutoff Road and down Mud Canyon, then back to Furnace Creek along Highway 190.